The entry-level 4G smartphone market is seeing a revolution like never before. With Jio’s 4G-enabled JioPhone gaining market-share by the day, other carriers have also jumped on the bandwagon, with companies like Airtel and BSNL also starting to offer their own devices at similar price-points. It is now the turn of Vodafone to get in on the act in an attempt to woo the first-time 4G user. While the company had earlier launched the Itel A20 Android smartphone at an ‘effective price’ of just Rs. 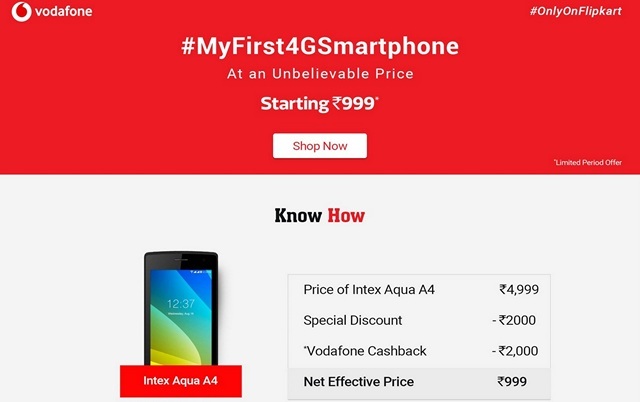 1,590 in partnership with China’s Itel Mobile, it is now offering substantial cashback on a select range of Android-based 4G smartphones being sold by Flipkart as part of a #MyFirst4GSmartphone scheme. These entry-level smartphones will be available from just ₹999 without exchange after all the applicable cashback and discount offers are applied. While the complete list of eligible smartphones is yet to be released officially, TelecomTalk is reporting that the list includes the iVoomi Me4, iVoomi i1, iVoomi i1S, Yu Yunique 2 and Yu Yunique 2 Plus, among others. More devices are also apparently expected to be added to that list going forward. 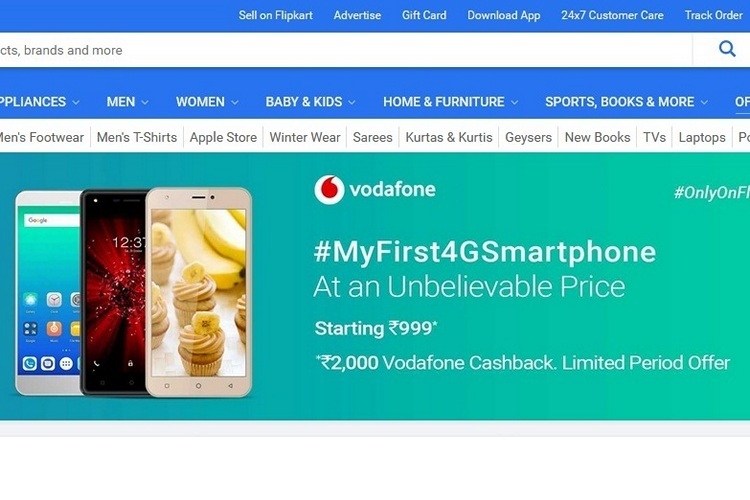 According to the terms of the deal, all new and existing Vodafone subscribers who purchase one of the select smartphones from Flipkart will need to recharge their prepaid accounts with a minimum of ₹150 per month for 36 months to be eligible for the cashback offers. While there’s no floor on how low each recharge can be, the total per month has to hit the ₹150 mark at the minimum. Users keeping up their end of the bargain will receive a cashback worth Rs. 900 after the first 18 months, while a further ₹1,100 will be credited at the end of the three-year period. In total, users will receive up to ₹2,000 in cashback after 36 months. It is worth noting here that the cashback will be credited to the subscribers’ M-Pesa wallets, but can be withdrawn at any point in time, so users won’t have to use the money only on Vodafone recharge.